**The #1 *New York Times *bestselling series finale and sequel to A Discovery of Witches and Shadow of Night. 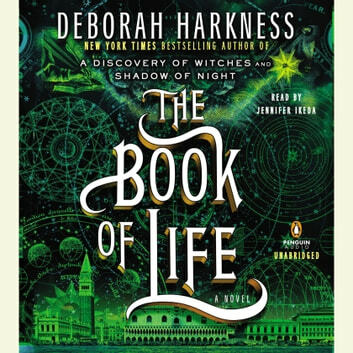 Bringing the magic and suspense of the All Souls Trilogy to a deeply satisfying conclusion, this highly anticipated finale went straight to #1 on the New York Times bestseller list. 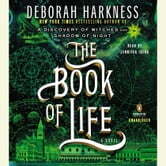 In *The Book of Life, *Diana and Matthew time-travel back from Elizabethan London to make a dramatic return to the present—facing new crises and old enemies. At Matthew’s ancestral home, Sept-Tours, they reunite with the beloved cast of characters from A Discovery of Witches—with one significant exception. But the real threat to their future has yet to be revealed, and when it is, the search for Ashmole 782 and its missing pages takes on even more urgency. Great continuation- I want more! I hope she continues the story of Matthew & Diana in future books. The story is amazing in itself, and Jennifer Ikeda’s soothing voice brings it to life. This whole series was entertaining and different than the usual vampire/supernatural stories that are everywhere these days. The narrator is very talented with accents and gives each character a personality that is consistent through all of the books in the series. Perfect ending. Thank you. I’ll miss mat n Dianne.